Work will continue by “pivoting away” from Star Wars. 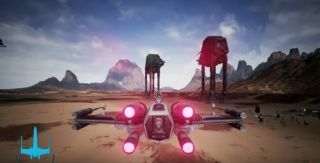 The ambitious fan-made revival of Free Radical’s abandoned Star Wars: Battlefront 3 has been cancelled. In June, FPS Frontwire Studios-creators of the unofficial Star Wars- announced Galaxy in Turmoil had been given the go-ahead from Valve to be shared for free on Steam. In a blog post shared on the Frontwire website yesterday, however, company president Tony Romanelli confirmed LucasFilm has issued a cease and desist order halting development immediately. Romanelli explains that although LucasFilm were “open to the idea” of working out a Star Wars-related license deal with Frontwire, its contract with EA does not allow it. He says that the latter’s concern lay with the possibility of Galaxy in Turmoil “taking away attention from their Battlefront franchise.” He in turn suggested the idea of putting Galaxy in Turmoil behind EA’s paywall, but this was also rejected. Although keen to stress the fact he and Frontwire have no hard feelings toward LucasFilm or EA, Romanelli goes on to discuss what the future holds for Galaxy in Turmoil. The full Galaxy in Turmoil post can be found this way, which includes some pretty neat, although now unusable, concept artwork.